When it comes to baby or wedding showers, don't you just love it when the gift you bring gets ooohs and aahhhs from the crowd? I certainly do. I seem to always have an internal struggle about whether to buy from the registry (stuff you KNOW they need) or to buy the wow factor gift. However, if I buy from the registry, I still do everything I can to give it a little pizzazz. 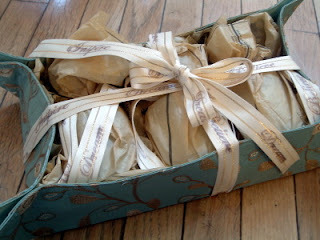 I have found a few tricks for picking things from the registry that can contribute to the gift's overall presentation. 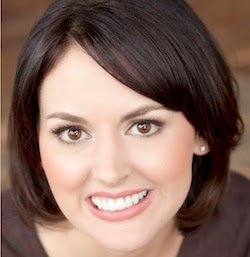 Hopefully, these tips will be helpful next time you are looking at the registry. 1. Baskets and containers are always a good start. If the mom or bride to be has register for a basket or container, you can kill two birds with one stone. If not, Angie at the The Country Chic Cottage has a tutorial on a brilliant idea to create a basket from a place mat. Also, the Dollar Store typically has a wide variety of sizes you can choose based on the size of your items. You will have plenty of money left for gift items and the gift receiver can use the basket in any way he/she chooses. The Country Chic Cottage creates a basket from a place mat! 2. Look for items that come in sets. Just like with home decor or tablescapes, repetition can add to the beauty and drama of the overall design and can make your eyes jump around the basket. In the giraffe baby basket I created, I took a group of hangers, removed them from the packaging (I justify this by the fact that it was on the registry...no need to take back), taped them into a heart shape, and strategically placed them throughout the basket. 3. Think about a focal point. Not every item included has to be exciting, but be conscious of what you want to be the focus. Your focal point doesn't have to be expensive. It can be a cheap, yet cute rattle or toy from the Dollar Store. In the basket above, I tied a bow around the neck of a giraffe (jungle themed nursery) that I got at a craft store for roughly 50 cents. 4. Ribbons, bows, shreddies, tissue paper & embellishments are cheap accessories that can add that pop of color you need. Start by filling your basket with wadded up paper, plastic or something like that. Then use shreddies and/or tissue paper to cover it. Tying ribbon around some or all of the objects can really bring a basket to life. Sara at Mom Endeavors shares a tutorial for creating an easy bow from magazines, and Colleen at Mural Makers has a video tutorial on making two different styles of florist bows. 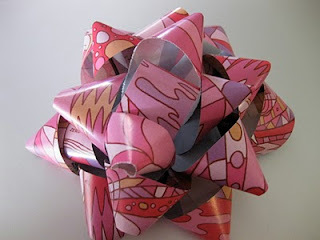 Mom Endeavors creates a bow from a magazine page! 5. Think about putting like items together. I don't feel like your basket always has to have a theme beyond "baby" or "wedding", but if the registry has plenty of items left to choose from, you might want to think of items that can be grouped together. So, if you are buying the baby bathtub, you might want to put bath time items inside the tub, or a laundry type basket could be accessorized with hangers, dreft, clothing, clothes pins, clothes dividers and other things like that. 6. Arrange and re-arrange your basket. Don't be discouraged if your first attempt to arrange the items is not successful. The more you play around with it, the more options you will think of trying. My hangers into heart shapes idea was the result of many unsuccessful attempts arrange my basket. I was featured at Mom Endeavors. A while back I bought one of those three section laundry hampers thinking it would be the solution to my Laundry Room (or lack of Laundry Room) problems. It provided a space for darks, lights & towels. Unfortunately, it was consistently covered with items that didn't fall into those categories -- Handwash & Stain Removal. So, I decided to remedy the problem with items I found at my local Dollar Tree and printables I made myself, which you can download at the bottom of this post. 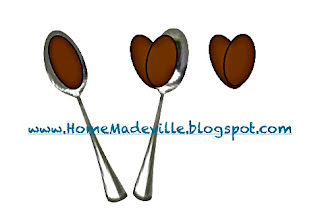 Last Week Abby gave us a great recipe for Gluten-Free No Bake Cookies here at HomeMadeville. As it turns out, these are my daughter's teacher's favorite cookies, so I wanted to make them for her birthday. The night before I made them, I was lying in bed thinking of how I could make them cute, and I had an epiphany. I decided to make them heart shaped. To me, it was one of those things where I wondered why I hadn't thought of it previously. The fact that you drop them by spoonful makes it so easy to do...no cookie cutters and no dough rolling! Step 1: Drop one spoonful of unhardened cookie mixture at a slight angle. Step 2: Drop the other spoonful at the same angle in the opposite direction. The texture and consistency of the cookie makes it where they are pretty much perfect immediately, but if you need to, you can certainly shape them up with your finger. I packaged them in a colorful takeout box befitting the teacher's vibrant and bubbly personality, and they were ready to be delivered. So this Valentine's Day, show your love to those around you in a tangible way with Heart Shaped No Bake Cookies (Gluten Free or Regular).